Hotpoint is one of the largest and best-known appliance brands in the UK. A potential electrical faulty has been found in selected dishwashers from the FDW series and as a result Hotpoint have issued a product recall notice. Potential Fire Hazard – Check Yours Today! The electric failing can cause the machine to overheat which can result in a risk of fire. The dishwashers potentially affected by this electrical fault were manufactured between June 2006 and March 2007. It is important that if you own a Hotpoint dishwasher that you check to see if it matches the affected serial numbers and contact Hotpoint directly for a resolution. 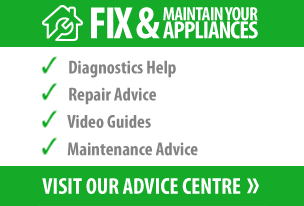 You can either call Hotpoint’s customer service line on 08448 910094 or email fdw@hotpoint.co.uk. The model and the serial number will be printed on the rating plate (sticker) on the inside of the dishwasher door. The Hotpoint serial number will usually be around 9 digits in length; however it is the first 5 digits that you need to check. If your model matches the above table and the serial number is between 60601 and 70331 then contact Hotpoint immediately for a repair.